According to Plato's ancient concept, non-material abstract ideas are more real than their physical embodiments. He would be thrilled to hear that this is the way the world is heading. Paper books that we used to proudly store on our shelves are being replaced by e-books. Instead of borrowing or buying CDs – we get access to digital music libraries floating somewhere in the cyberspace. And when we want to pay, we less and less frequently reach out for a wallet. Unless it is a digital one. The world is slowly going cash-free and the Nordics are in the lead. It is predicted that they will get rid of cash by 2030. So far the transition has been happening in a natural way – by customers' choice. However, the Danish government may back it up with a legal action and allow certain shops and service providers to refuse cash transactions as soon as of January 2016. Such a proposal has been made by the Danish Chambers of Commerce. The steady reduction of cash usage is welcomed by all: the customers, the business and the authorities. Each group has their own reasons to support the change while security is the common goal. Customers do not need to carry a stash of cash and expose themselves to a potential risk of theft. And at the end of the month they do not need to wonder where the money went. A neat bank statement allows to track down every single transaction. For business cashless transactions mean increased security and savings in time and money, as dealing with cash is costly and time consuming. A study prepared by Bhaskar Chakravoti and Benjamin Mazotta from Tufts University, Massachusetts states that a combined cost of handling cash by customers, business and government in the US only amounts to around 200 billion dollars every year. According to the "World Payments Report 2014" by Cap Gemini, annual growth in global cash-free transactions increased by 7.7 per cent. New payment technologies such as digital wallets, cryptocurrencies, and peer-to-peer payments reached the boiling point and we shall soon see them growing rapidly. The payments sector traditionally used to be a part of financial services. However, the payment revolution we are witnessing, sets the sector free and customers can not only choose the method of payment, but also decide who handles their transaction. And they are no longer limited to banks. Other players already present or entering the payments sector include computer superpowers such as Apple, internet masters like PayPal, Google or Facebook, mobile phone providers, and retailers. Not to mention innumerable start-ups sensing a new business opportunity. Paying by a card is easy, fast and convenient. Customers and business like it and until recently it was a digital currency of choice. In the 1990s plastic won a battle against a new competitor – digital money. The very first digital cash company – DigiCash – was founded in 1990 by David Chaum, a cryptology master. His idea was to create a digital payment tool as secure and anonymous as cash. But he was way ahead of his time. Nobody wanted his invention and DigiCash went bankrupt eight years later. Although the preference has changed and customers expect a wider choice of payment methods now, cards remain a powerful tool. They are the key to the vaults of our bank accounts. Mobile and online payments have to be linked to our money somehow, and they are linked either via bank account or a credit card. 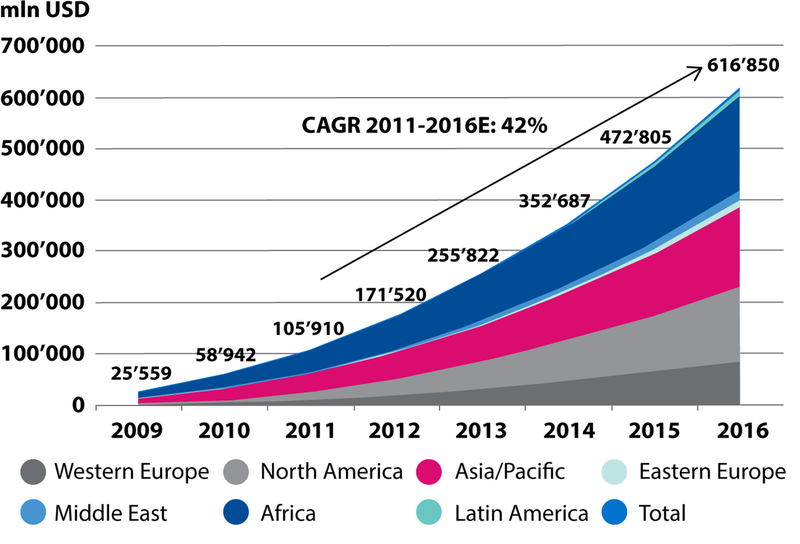 With global non-cash payments on the rise, the new credit cards' potential is slowly being tapped to. The CapGemini report confirms that cards are the main driver of the growth in cash-free transactions. 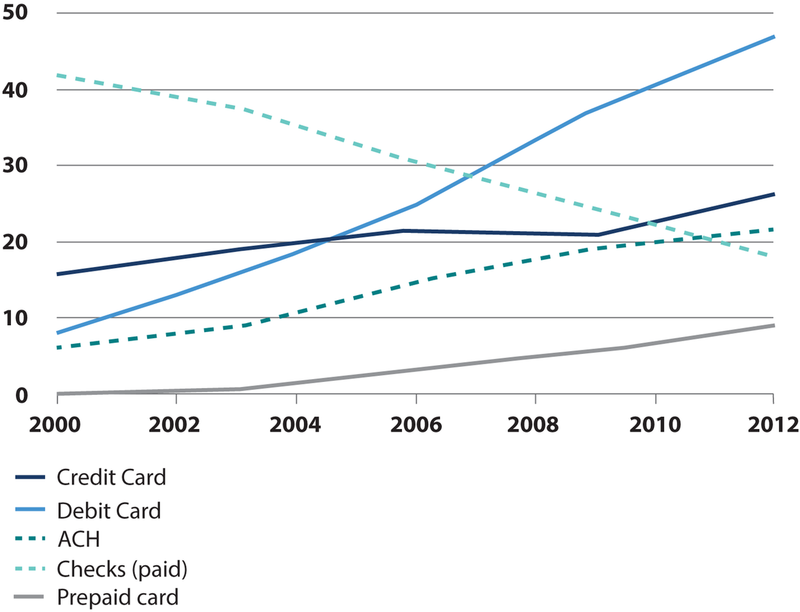 In 2012 debit and card usage increased all over the world: the former by 13,4 per cent and the latter by 9,9 per cent. Additionally, as stated by Uwe Neumann, "Their reputation for security will make them a good alternative to the much-discussed marketing and data-based mobile payments initiatives." Over the last few decades the Internet has opened up a world of brand new possibilities, desires and demands. Online shopping is one of them. And when there is shopping, there has to be a checkout. Undoubtedly, the king of online payment is Ebay's PayPal. The company acts as an intermediary between the seller and the buyer. It has been present on the market since 1998 and at the moment is the biggest online wallet provider, processing almost 12,5 million transactions daily. PayPal's last quarter results state a 14 per cent growth in revenue and an 11 per cent increase in the number of active customer accounts, both figures are YoY. With even newer possibilities opened by mobile payments, PayPal is now trying to extend its reach to mobile and retail purchases. To use PayPal in a "real" shop, customers need to connect to the cloud and access their account. Not a big deal considering that the internet is omnipresent these days. The expansion of smartphones allowed new players on the market who are eager to exploit the potential of the device and have the know-how to do so. Uwe Neumann from the Global research team expects a high growth in mobile payments in the near future. He points out a forecast by Gartner, an IT research and advisory company. According to their study, global value of mobile transactions will grow on average by 42 per cent yearly and is expected to reach 617 billion dollars by 2016. This method of payment will expand particularly fast in developing regions, says Neumann. For Africa and Asia mobile transaction systems are important due to the insufficient banking facilities. Uwe Neumann recognizes two types of the sector new entrants. One group, including Google Wallet, focuses on collecting and monetizing customer transaction data. While the second group, which includes Paypal, aims to bypass some traditional players in the payment chain. Google is already quite advanced in terms of reaching their goal. Google account holders can keep their entire digital life under one roof: e-mails, documents, pictures, maps and travel history, as well as money. The Google Wallet app not only allows to pay in shops and online or withdraw cash from a cashpoint, but it also allows Gmail users to send money as e-mail attachment. A new service introduced by Apple can become a strong competitor for Google. Apple Pay also uses the contactless payment terminals and allows payments via a mobile phone or such Apple devices as iPad or Apple Watch. The company announced recently that it will be launched in the UK in July. Currently, the Innovation team within Credit Suisse is screening the market searching for a suitable mobile solution. Swiss customers may expect an innovative payment option next year. Uwe Neumann concludes: "The most promising sustainable payment platforms seems to be the ones from the big internet platform firms: eBay with PayPal (spin-off is planned in 2015), Apple Pay, Android Pay, Samsung Pay. Although, there is a huge number of smaller companies which offer applications to pay with a smartphone, we think that the big internet platform firms have the power to set standards." While the new payments are set to make customers lives easier, there is something in it also for the new payments providers. It is something personal, that belongs to us and is extremely valuable. Data. Google, Apple and Facebook already know a lot about their users and do monetize the knowledge. "Finding out the users' spending habits is the last missing piece of information", says Daniel Höfelmann from the Innovation team within Credit Suisse Digital Private Banking. Uwe Neumann confirms his words by saying that "the next key battle will be about using the customer purchase data associated with the payments." The parties interested in customers' data are both the new players and the companies already active in the field of payments. However, customers who value their privacy are expected to stick with traditional payments method or new payment options provided by a bank. The bank's policy to keep data safe and secure may be the winning card in the war of wallets. The payments sector is undergoing a dramatic change. To make things more difficult for everyone it is happening at a breakneck pace. With the highly supported drive to reduce the cash usage, growing payment infrastructure and further development of online business, it is clear that the future is cash-free. However, which solution will dominate the market and who will set the industry's new standard is yet to be seen. "The times are both challenging and exciting, but the cashless society is rather a long-term perspective", concludes Daniel Höfelmann. Is active Will We Soon Live in a Cashless Society?